any of the wonderful books that have gone out of copyright frequently used drop caps (those fancy letters at the beginning of paragraphs). 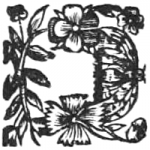 Since they only used a letter where needed, the books typically did not use all of the letters of the alphabet. 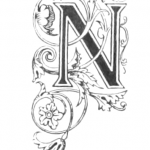 We have collected those fancy letters that are free for you to use with your websites, scrapbooking, card making, mixed media art and other arts and crafts projects. 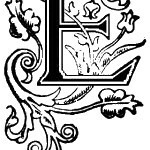 All of these fancy letters been found in books, magazines and other printed materials that are out of copyright in the United States; making each of these images free to use. There are many wonderful websites that sell or provide free downloads of fonts. 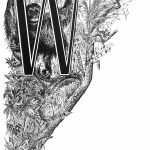 The fancy letters included here will not be typically found in font collections and offer artists and crafters fancier and more interesting choices for their next project. We will be continually adding more fancy letters as we find them. 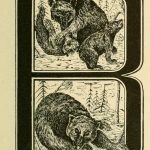 These drop cap images could easily be used for any letter of the alphabet. Simply add the letter of your choice in the font-face of your choice to make them your own. 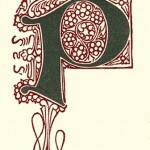 Collection of vintage fancy letter A images. A is for apple and it can be for your artistic endeavors as well. B is for the best, black and white and color drop caps here on Reusable Art. This group of drop caps all feature the second letter of the alphabet. From calligraphy to candlesticks and curlicues. A little bit of everything here amongst this section of Reusable Art. Fancy, decorative and ready for downloading. Darn but these sure are some sweet D drawings. 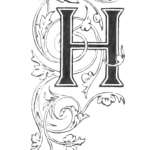 They are great for monograms, scrapbook pages and whatever creative projects you can dream up. Big or little. Dark or light. 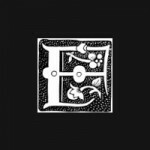 Get your fill of public domain Es to add to your own written and artistic projects. Free for downloading. 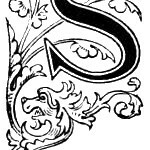 From a fox to flowers and flourishes, this fabulous collection of fancy letter Fs is sure to fight boredom and turn your projects from hum drum to fabulous. Goodness knows but every one of this group of drop caps includes a G. They are great for gracing your own pieces and glamming up your day. Happiness could be finding the perfect H for your artist trading card or scrapbook page. Hurray for Hollywood and hot diggity dog. Imagine what you could create with a group of vintage illustrations that are absolutely free and safe to use without worries about copyright restrictions. Just a few in this group so far but hopefully you will find exactly what you need or at least close enough to make you jolly. Kindly let me say it is a challenge finding letter K images. Reusable Art has a few for you and hopefully one will give your project a real kick. 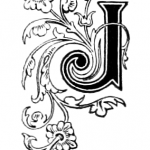 Lambs, leaves and lily of the valley, decorate and adorn these mostly black and white letter forms. Make the most of these magnificent Ms in your own magical creations. Maybe it will be flowers or leaves or berries or even a bird you will find too. Need an N? We have quite a few here on Reusable Art. 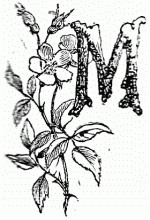 Curlicues, flowers, leaves and all sorts of things decorate these vintage drawings. There once was a collection of Os. They have flowers and leaves and bows. Fancy and 100% copyright free. Open them up this category and let us see. Precisely placed, perfectly positioned at the beginning of a paragraph these images add polish and panache to just about everywhere you need a P.
Quite simply there are not many words that begin with a Q. 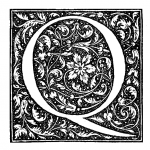 But, if you need a vintage letter Q image, I have a few here on Reusable Art that you might consider. As often as I type an R, it seems odd that so few of them are used to start paragraphs and sentences. Simply splendid. A big S, a little S or something in between. We have lots of choices, free for downloading. T-H-E is probably one of the most used words in the English language. It often starts paragraphs, which is why we have lots of Ts here on Reusable Art. Unique is what your project will be if you incorporate vintage art with your own creative talents. Need a U? We have several for you to pick from. 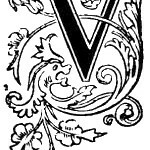 Very few things begin with a V but we hope to find them for you. Vintage illustrations from books, magazines and a variety of other printed materials. Whatever you are making, what makes it special are those little bits and pieces you have gathered that make it wonderful. A W might be what you need. Yesterday print foundries provided engraving plates to publishers of drop cap drawings like this group of Ys. Today we can use them for new projects. Zip-pee-do-dah how few words start with the letter Z. But, we have some vintage images here for you particularly if you want to visit the zoo.